Steve O'Dwyer enjoys a ninth-straight week at No. 1 in the overall @GPI rankings. Both David Peters and Stephen Chidwick join this week's @GPI top 10. Each week, the Global Poker Index releases a list of the top tournament poker players in the world using a formula that takes into account a player’s results over six half-year periods. For a look at the entire list, visit the official GPI website. Here’s a look at the rankings as of March 9, 2016. It’s coming soon, we hear — that is, the first list of 2016 indicating where things stand in this year’s Global Poker Index Player of the Year race. Each year the GPI looks at a player’s best 13 results (in terms of GPI POY points earned) from January 1 to December 31 in order to calcuate totals for its POY. Read more here about how the GPI POY is determined. Meanwhile let’s see how the overall GPI rankings have changed over the last seven days. The top of the list remains unchanged this week as Steve O’Dwyer enjoys a ninth-straight week at No. 1 in the overall rankings. 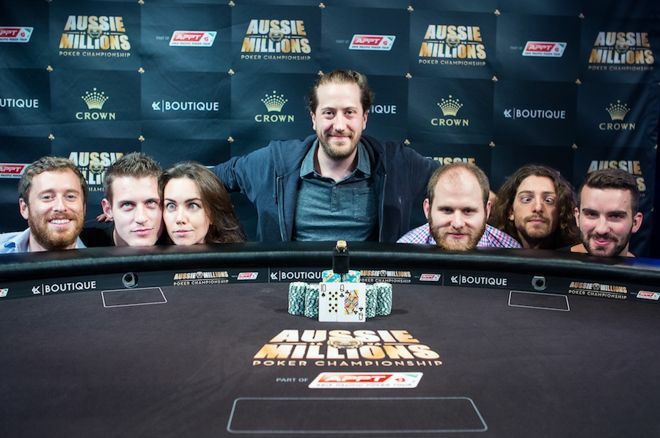 O’Dwyer (pictured up top following his win in the Aussie Millions LK Boutique $250,000 Challenge in January) didn’t need that result to maintain his frontrunner status in the rankings during a relatively quiet tournament week. He remains in front of Byron Kaverman, the player he overtook in the rankings to start this year. Bryn Kenney moves up from No. 5 to No. 3 on the strength of his win in the $25K ARIA High Roller XXVII this past Saturday where he topped a 44-entry field to win $422,400. Kenney’s highest previous GPI ranking has been No. 2 in January 2015. In fact, Kenney has been ranked no lower than No. 12 since late 2014, spending the majority of the last 15 months inside the overall top 10. There are two newcomers in this week’s top 10. David Peters took fourth in that same ARIA High Roller won by Kenney, helping him go from No. 11 to No. 9 this week. And Stephen Chidwick likewise returns to the list, having moved from No. 16 to No. 10 following a couple of cashes in the World Poker Tour L.A. Classic series, including one in the Main Event where he finished 25th. There was a bit of shuffling down at the other end of the GPI top 300 this week with no less than 15 new names joining the list and Joe Serock the highest-ranked among them. Serock moved all of the way from No. 350 to No. 175 after cashing in that aforementioned WPT L.A. Poker Classic Main Event (finishing 28th), then final-tabling the WPT L.A. Poker Classic High Roller (finishing fourth). A fifth-place finish in the Macau Poker Cup 24 High Roller event helped Louis Salter make a big move as well, going from No. 315 to No. 195. Salter’s previous career-high ranking has been No. 143, achieved in December 2014. Incidentally, Louis’ brother, Jack Salter, also made that same final table, finishing fourth. Jack first entered the GPI top 300 in late 2013 and has remained on the list ever since, currently sitting at No. 40. Of all 15 newcomers to the top 300 this week, only two of them are making debuts on the list. Sam Soverel jumped from No. 565 to No. 267 after finishing fourth in the WPT L.A. Poker Classic Main Event, his first time inside the top 300. And Elliot Smith has come close before (getting to No. 304 back in February 2013), but finally broke through after moving up from No. 392 to No. 279 after cashing along with the Salter brothers in that Macau Poker Cup 24 High Roller, finishing 11th. Those upward moves by Soverel and Serock were the biggest of the week among players currently in the top 300. A couple of cashes at the Commerce including a ninth-place in the WPT L.A. Poker Classic Main Event helped Tyler Reiman make a big jump as well to go from No. 374 to No. 204. Finally, considering only those players ranked in the top 300, two-time Latin American Poker Tour champion Oscar Alache dropped the furthest this week after slipping from No. 220 to No. 277. Alache — the LAPT Season 8 Player of Year last year — won the second of his titles at LAPT Chile just over one year ago, and thus lost a few points earned from that win thanks to the GPI’s aging factor. The WPT Bay 101 Shooting Star in San Jose, California highlights this weeks’ tournament action, with the 2016 Wynn Classic also well underway in Las Vegas. Meanwhile the partypoker WPT Vienna series has already kicked off as well in Austria.